The Learn Spanish with Pictures activities are a fun way to speak Spanish with children. I added audio of the description to one of the photos with a few on-screen cues to focus kids’ attention. This makes easy Spanish listening practice for kids and leads naturally into talking about the photo. All the Learn Spanish with Pictures activities have a photo with a description in Spanish and questions. The description provides easy Spanish listening practice, but I have had both teachers and parents ask for help with correct pronunciation. I hope that having the audio makes the activities more useful for everyone. The questions that follow are very focused, with lots of repetition. They are ordered to help kids master the vocabulary and gain confidence with the language. The idea is that teachers and parents point to the pictures and add gestures and expression to help kids understand new language. 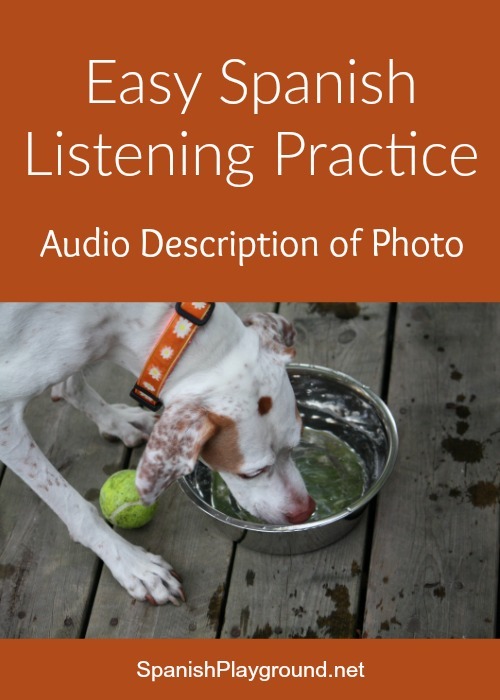 Easy Spanish listening practice is ideally done face-to-face and that is how the Learn Spanish with Pictures activities are intended to be used. The voice over does not include the questions; it is simply a way to have kids hear additional Spanish. Then parents and teachers need to repeat and follow up with the questions. I did find that having the voice over on the photo works well with a large group. It is also nice to be able to pause the video with the circle or arrow on the screen. It is easy Spanish listening practice and combines naturally with the kids speaking Spanish, too. See the original A Thirsty Dog post if you prefer to work with the photo. I have included the questions and vocabulary below. Vamos a describir la foto de un perro. Un perro toma agua. El perro es de color blanco con manchas de color café. Tiene manchas en las orejas y una mancha en el centro de la cabeza. Lleva un collar de color anaranjado. El perro tiene mucha sed. Toma agua de un plato de metal. Hay una pelota de tenis entre las patas del perro. La pelota es amarilla. El perro tiene mucha sed porque jugaba a la pelota. ¿El perro come o toma agua? ¿El perro tiene sed o tiene hambre? ¿La pelota es amarilla o anaranjada? ¿El collar es color café o color anaranjado? ¿Dónde están las orejas del perro? ¿Cuántas orejas tiene el perro? ¿La pelota está en el plato? ¿El agua está en el plato? Este ejercicio es perfecto! Me gusta mucho. Quiero más ejercicios como éste. Muchas gracias! This is excellent! We are a homeschool family and my daughter loves the Picture talks and having audio description is very helpful to hear a true accent and get pronunciation correct. We love the Spanish Playground website! Keep it coming.